Set to be played April 29-May 5, 2019 at Parque Parota, the Puerto Vallarta Open will have a prize of $135,400 USD and ATP ranking. For more information please visit the Facebook event page. Puerto Vallarta, Mexico - The Association of Tennis Professionals (ATP) has announced the Challenger Tour Tournaments of the Year for 2018, and Puerto Vallarta, Mexico, which made its debut on the ATP tour calendar last year with the Puerto Vallarta Open, was among the players' favorite destinations in 2018. The Challenger of the Year Awards recognize excellence in established standards in the global Challenger Tour which, in 2018, comprised 159 tournaments staged in 40 countries. In addition to Puerto Vallarta, last year's winners included the Vancouver (Canada) and Heilbronn (Germany) Challenger Tour stops for the second consecutive year. ATP Challenger Tour Committee Co-Chairs, Alison Lee, ATP International Executive Vice President and Ross Hutchins, Chief Player Officer, said "These three Challengers are relatively new on the ATP Challenger Tour calendar and the organizers have set themselves very high standards to win these awards of excellence. It takes hard work, dedication and a passion for tennis to make successful tournaments, and players, fans, sponsors and media will have all seen these Challenger promoters' enormous efforts come to fruition." Puerto Vallarta Open Tournament Director, Francisco Javier Romero Gonzalez, said, "We sincerely thank ATP and are deeply grateful to all those who made the PVO possible, not only those who worked and contributed their knowledge, but also those who believed in us and placed their trust in our first edition of the Puerto Vallarta Open. It is a source of great pride to see Puerto Vallarta take its place among the best in the world of tennis and for the opportunity to present it for what it is, one of the most complete and beautiful tourist destinations on the planet." Puerto Vallarta has a long history with the ATP. The city held its first Challenge in 1994 and hosted tournaments for the ATP Challenger Tour and the Women's Tennis Association (WTA) from 1996 to 1998. International Tennis Federation (ITF) Futures Tournaments were held in Puerto Vallarta from 2000 to 2010. Tennis legends such as Martina Navrátilová, Billie Jean King, Vasek Pospisil, Santiago González Torre have played in Puerto Vallarta. 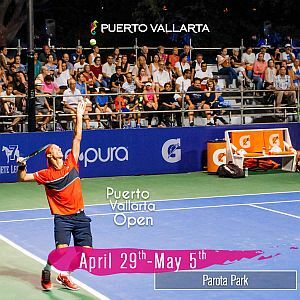 With a prize purse of $135,400 USD, this year's Puerto Vallarta Open will be played from April 29 to May 5, 2019 on the outdoor hard courts at Parque Parota, located at Avenida Francisco Medina Ascencio LB S/N, Fluvial Vallarta. For tickets or more information, please visit PuertoVallartaOpen.com.